Our diagnostic testing center offers state-of-the-art technology, including EKG, treadmill testing, nuclear stress testing, T-Wave testing, Holter and event monitoring, rest and stress exercise echocardiography, carotid ultrasound, pacemaker and AICD surveillance, and Ankle Brachial Index. These non-invasive tests provide our cardiologists with information about the function of your cardiovascular system, so that we may best determine how to protect your heart health. The general status of your pacemaker or defibrillator can be checked sometimes by phone – to make sure it is functioning correctly. The Holter monitor is a portable device that continuously records the heart’s rhythm over a 72 hour period. This test monitors all types of arrhythmias and silent ischemia. You will be asked to keep a diary that the physician uses to correlate your activities with symptoms and cardiac rhythms. The Event Monitor is a 30 day auto-triggered monitor to catch those occasional symptoms and arrhythmias. The major arteries that supply the brain can be easily seen with ultrasound to find plaque deposits and measure any obstruction to blood flow. 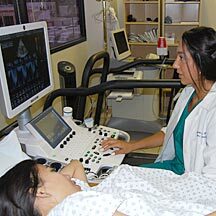 An echocardiogram utilizes sound waves to produce a picture of the heart and its valves in motion. Moving a hand-held device across your chest transmits an image that is taped for analysis by your cardiologist. Echocardiograms can reveal the strength of the heart, heart valve problems, cause of enlarged hearts, as well as congenital heart defects, pericardial disease and effects of coronary disease. A combination of treadmill testing and echocardiography, this test offers more diagnostic details about how exercise affects your heart. The primary purpose of this test is to evaluate the heart for blockages of the coronary arteries. 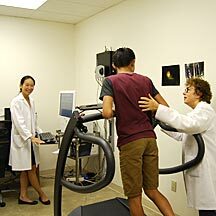 Treadmill testing evaluates the heart’s response to physical exercise. You will walk on a treadmill, which gradually increases in speed and elevation. During the entire test, your EKG, heart rate rhythm, blood pressure and symptoms are monitored by a physician, nurse or cardiovascular technician. Some patients may not be able to walk on a treadmill safely. A pacemaker, abnormal resting EKG, and certain medications can also interfere with the accuracy of treadmill testing. In these patients, we will perform pharmacologic stress testing. This involves a 6-minute infusion of a medication called adenosine. Adenosine is a natural substance produced in the body. When given for stress tests, adenosine increases blood flow to the heart and provides similar information regarding coronary artery disease as does walking on a treadmill. This is a painless non-invasive test to evaluate blood circulation in the legs. 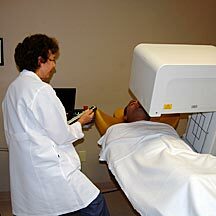 The test uses blood pressure measurements with Doppler Ultrasound to check peripheral pulses. It is indicated for those patients with pain or fatigue in the legs with walking that is relieved by rest or those with non-healing wound ulcers. The ABI is a strong predictor of arterial disease of the heart and brain.